The message to beat the bike thieves is simple; invest in the best lock that you can because two thirds of thieves are beating cheaper ones. Cyclists using their bikes to get in and out of Dublin are being warned to get real and buy the best lock they possibly can. The message has been issued by the Bike Theft Working Group, which has revealed a huge 66 per cent of bikes stolen in Dublin were locked with easy to cut locks and chains. These include cable locks or cheap chain and padlocks. The group, which involves several stakeholders and has been put together by Dublin City Council, has also revealed bike thefts have increased by far more than double in the last seven years in the capital. Some 4,950 bikes were stolen in the country’s biggest city last year, an increase of 167 per cent on the 1,873 mounts taken back in 2008. That level of increase makes bike theft the fastest growing recorded crime type in the country over that period. And with a large number of bike thefts going unreported, the true number is almost certainly a lot higher. The Bike Theft Working Group has published the figures to mark the launch of its Bike Security Campaign. The working group’s Críona Ní Dhálaigh said the main aim of the campaign was to raise awareness of the issue of bike theft and alert cyclists of the need to use higher quality locks to lower the risk of their bikes being stolen. “It is vital that cycling is supported and encouraged in the city and a big part of this is to reduce bike theft,” she said. The Bike Theft Group recommends that cyclists use U-locks with the Sold Secure accreditation as their main lock, with cable or chain and padlocks only to be used as a secondary lock. Sold Secure is an independent rating system for locks. Use U-locks with the Sold Secure accreditation; silver or gold standard. Lock your bike at home – bikes get stolen from gardens and sheds. Record your serial number and take a selfies or photo of you with bike. Don’t buy a bike you think might have been stolen – ask for a receipt. 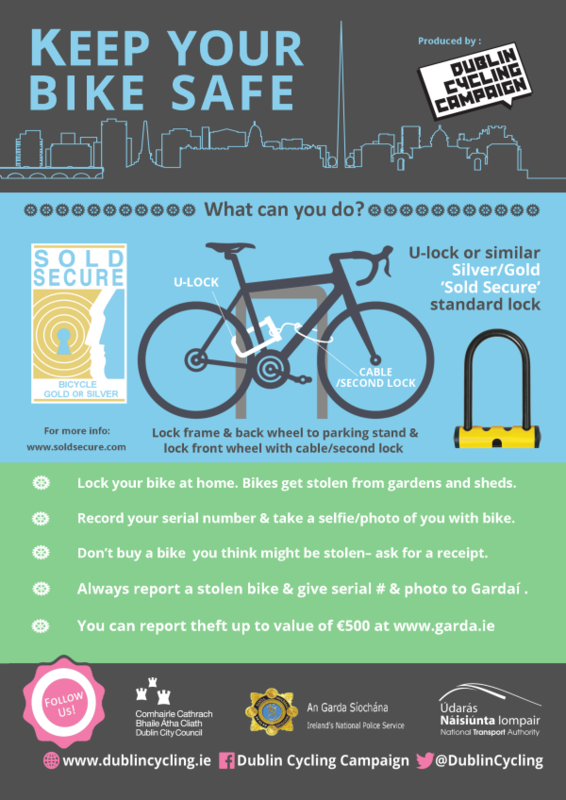 Always report a stolen bike and give the serial number and photo to Gardai. You can report theft up to value of €500 online at Garda.ie. David Timoney of the Dublin Cycling Campaign said: “The evidence from our own survey as well as surveys in the UK shows that there is a strong link between bike theft and cycling numbers. The Bike Theft working group was set up earlier this year to tackle the growing problem of bike theft in the city. It includes representatives from An Garda Síochána, the National Transport Authority, Dublin Cycling Campaign, bike shops and Dublin City Council. “London and Amsterdam in particular have had great success in reducing bike theft in recent years and with all stakeholders working together through this Bike Theft Group we aim to achieve the same in Dublin” said Cllr Ciaran Cuffe, who chairs the group. The National Transport Authority (NTA) representative on the group, Cormac Ross said the popularity of cycling in recent years was helping to drive bike theft. “The use of higher quality locks by cyclists is likely to result in the most significant positive impact on theft numbers in the short term, and this initiative is focused on the delivery of that key message”. He added the NTA was currently funding measures including an increase in well-located on-street cycle parking facilities around the capital, as well as the development and expansion of secure off-street cycle parking at Drury Street and elsewhere.